You may also take a look at the new Python 2.x based antenna pointing tool called Scanmeternm.py. Although there are many great WiFi related programs available for Linux there isn’t a good antenna setup software like the Netstumbler in Windows. Of course, Linux has the all powerful Kismet and the simple to use Wavemon but neither is very useful when it comes to measuring 802.11 RF signal level and plotting a histogram. I build and test high gain WiFi antennas as a hobby and need a simple measuring tool so I wrote Scanmeter which is a bash script that measures signal strength and displays the wireless strength in a histogram [Fig. 1]. High gain antennas are directional by design. When pointing a directional antenna it is important to measure the WiFi signal level as we move the antenna. Even when you know the general direction of the access point, small azimuth angle, elevation and polarization corrections can produce big differences in signal amplitude. This is especially true for distant WiFi access points. Imagine shining a laser pointer at a building several blocks away. A small movement of hand will move the laser dot in large sweeps. WiFi antennas are not as focused as a laser beam but when going for distance every dB counts so it is important to aim right. Scanmeter features a continuously updating histogram. While you are adjusting the position of your high gain WiFi antenna the signal is plotted on screen live so you can find the “sweet spot” without guessing. Download and unpack the script to your /home/yourname directory. There are better places to save a bash script like /usr/local/bin for example. Look up a tutorial on saving and executing bash scripts for more information. Scanmeter is very self explanatory. Make sure you use all caps when typing in the BSSID (MAC Address). Press CTRL+C to exit the histogram. 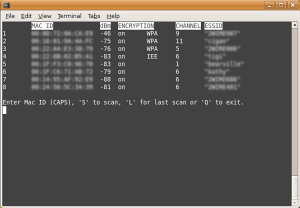 Pressing enter in the main menu prompt will restart scanning with the last entered BSSID. The physical formatting of the iwlist command output depends on the wireless chipset, the driver and possibly the Linux distro. For this reason you may have to make minimal adjustments to the script to make it work. 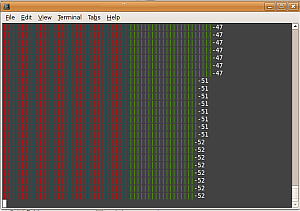 Check out Pifimon which is a Perl script inspired by Scanmeter (and improved). If you improve scanmeter or make similar tools let me know please.